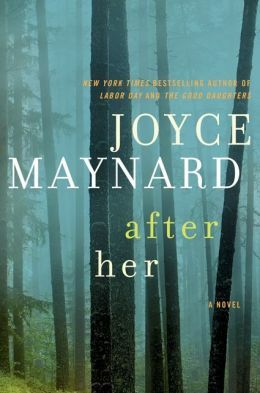 In her previous book Labor Day, Joyce Maynard did such a good job portraying ordinary people doing ordinary things in a really pretty bizzarre situation, and I was hoping for another book with that kind of pacing and tension. I was not disappointed! After Her is the story of two little girls, Farrah and Patty, the daughters of a policeman, during a time that encompasses the hunt for a dangerous serial killer. The girls go about daily life- school, first crushes, playing basketball, wanting a dog- with murder looming onimously in thr background. Finally the girls fall into an encounter with the killer himself- or do they? The biggest qualm I had with After Her is that it seemed like there were too many side story lines. To me, it was primarily about the dad and the women he loved; the sisters; and a coming-of-age story set against the backdrop of a serial murderer. But then there were all the neighbors, and dogs, and basketball, and all this stuff that was far more detailed then it needed to be. When the author stuck to the characters and themes at the center of the story, it was very good; but in the other sections, my interest wandered. There was, however, one section that I loved unreservedly- just a few pages in which Joyce Maynard has written a reflection in Farrah’s voice about how strange and wonderful it is to be a 13-yeat old girl. I felt like that was just brilliant! That chapter and the next 50 or so pages felt like the heart of the book, and I came back to the book a second time just to read those pages again. This entry was posted in Fiction and tagged book review, coming of age, family, fiction, murder, sisters. Bookmark the permalink.